Our IL300 LED fixtures are designed to disappear until you need them … at night. The fixture body is purposefully small and compact to be unnoticeable during the day. 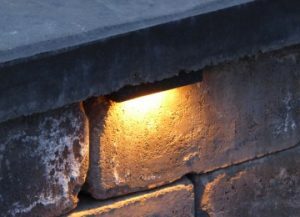 In the evening hours, this fixture delivers an impressive glow on your hardscape, enhancing your home’s outdoor features. The fixture body is made from strong and durable materials, ensuring it will last the lifetime of your hardscape. Equipped with an energy efficient LED package and available in four different color outputs: 2400K ultrawarm white, 2700K warm white, 3000K white or 4200K cool white. Choose from 10 professional quality powder coated finishes to coordinate with your project.